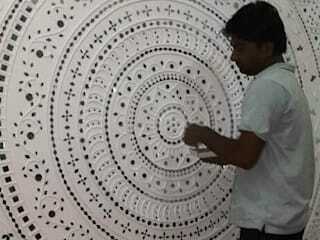 We bring indian traditional wallart called Mud Mirror Work(Lippan Work) from kutchh to its audience. We offer high quality portable mud mirror work frame which can be moved from one place or wall to the other and can be installed as per requirement and choice. This amazing work of art is no more a onetime use thing but can be reused as many times as desired. The material used in the frame is ensured to be of best quality which guarantees durability and reliability to the product. It looks very attractive in hotel, restaurants, offices, behind reception counter, waiting areas, restaurant walls, villas, farm house and many more locations. For more details call us on +91 9924056867.